Mix all the ingredients of the marinate together very well in a bowl. Clean the chicken and remove it of any fat that is seen. Now with a sharp knife, make random slits all over it. Cover the chicken very well with the marinate mixture and keep in a tightly covered bowl to refrigerate. You must refrigerate the chicken overnight before cooking. Once this is done, you should remove the chicken from the marinate and grill for tem minutes on each side or till it cooked well. Remember not to let the chicken char. Sprinkle chat masala powder, lemon juice and serve hot. 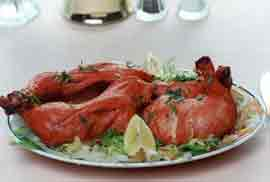 How does the chicken gets it red tandoori color, as shown in the picture? Do I use boneless chicken breast or bone-in chicken breast? Thanks! Thank you for a nice and easy recipe. Some times ingredients might be simple but it is full of taste and flavour, Thanks.